The technique could lead to a new type of diagnostic imaging technology and may someday serve as a way to move medications to parts of the body where signs of disease have been found. In a study published in the Aug. 27-31 Online Early Edition of Proceedings of the National Academy of Sciences, the researchers reported success in using the synthetic protein in mouse models to locate prostate and pancreatic cancers, as well as to detect abnormal bone growth activity associated with Marfan syndrome. Pictured is an optical image of mouse that was injected with a fluorescently tagged peptide that binds to degraded collagen (seen as red) and a commercially available imaging agent that binds to the calcium in bones (seen as green). Areas where both compounds are present appear as yellow. The purpose of these tests was to show that the peptides can target bone and cartilage of living animals by binding to degraded collagen. The peptide could someday deliver imaging agents and medications to combat various human disorders such as cancers, arthritis and fibrosis, which are associated with excess collagen degradation. The synthetic protein developed by the Johns Hopkins team does not zero in directly on the diseased cells. Instead, it binds to nearby collagen that has been degraded by various health disorders. Collagen, the body’s most abundant protein, provides structure and creates a sturdy framework upon which cells build nerves, bone and skin. Some buildup and degradation of collagen is normal, but disease cells such as cancer can send out enzymes that break down collagen at an accelerated pace. It is this excessive damage, caused by disease, that the new synthetic protein can detect, the researchers said. 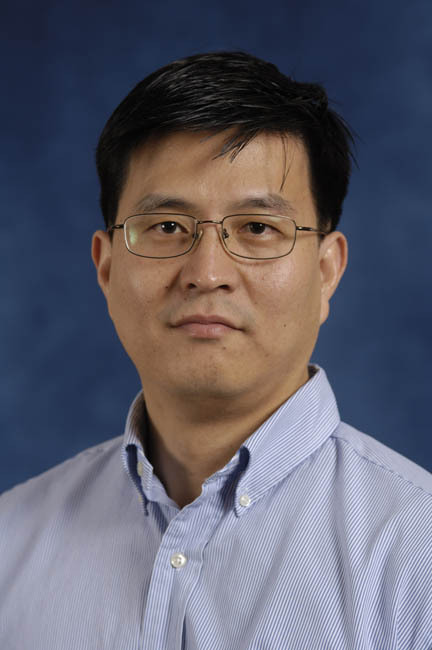 “These disease cells are like burglars who break into a house and do lots of damage but who are not there when the police arrive,” said S. Michael Yu, a faculty member in the Whiting School of Engineering’s Department of Materials Science and Engineering. “Instead of looking for the burglars, our synthetic protein is reacting to evidence left at the scene of the crime,” said Yu, who was principal investigator in the study. The synthetic proteins used in the study are called collagen mimetic peptides or CMPs. These tiny bits of protein are attracted to and physically bind to degraded strands of collagen, particularly those damaged by disease. Fluorescent tags are placed on each CMP so that it will show up when doctors scan tissue with fluorescent imaging equipment. The glowing areas indicate the location of damaged collagen that is likely to be associated with disease. In developing the technique, the researchers faced a challenge because CMPs tend to bind with one another and form their own structures, similar to DNA, in a way that would cause them to ignore the disease-linked collagen targeted by the researchers. To remedy this, the study’s lead author, Yang Li, synthesized CMPs that possess a chemical “cage” to keep the proteins from binding with one another. Just prior to entering the bloodstream to search for damaged collagen, a powerful ultraviolet light is used to “unlock” the cage and allow the CMPs to initiate their disease-tracking mission. Li is a doctoral student from the Department of Chemistry in the Krieger School of Arts and Sciences at Johns Hopkins. Yu, who holds a joint appointment in that department, is his doctoral adviser. Yu’s team tested Li’s fluorescently tagged and caged peptides by injecting them into lab mice that possessed both prostate and pancreatic human cancer cells. Through a series of fluorescent images taken over four days, researchers tracked single strands of the synthetic protein spreading throughout the tumor sites via blood vessels and binding to collagen that had been damaged by cancer. Similar in vivo tests showed that the CMP can target bones and cartilage that contain large amounts of degraded collagen. Therefore, the new protein could be used for diagnosis and treatment related to bone and cartilage damage. Although the process is not well understood, the breakdown and rebuilding of collagen is thought to play a role in the excessive bone growth found in patients with Marfan syndrome. Yu’s team tested their CMPs on a mouse model for this disease and saw increased CMP binding in the ribs and spines of the Marfan mice, as compared to the control mice. Funding for the research was provided by the National Science Foundation, the National Institutes of Health and the Department of Defense. The synthetic protein process used in this research is protected by patents obtained through the Johns Hopkins Technology Transfer Office. Along with Yu, Li and Pomper, co-authors of this study were instructor Catherine A. Foss and medical resident Collin M. Torok from the Department of Radiology and Radiological Science at the Johns Hopkins School of Medicine; Harry C. Dietz, a professor, and Jefferson J. Doyle, a doctoral student, both of the Howard Hughes Medical Institute and Institute of Genetic Medicine at the School of Medicine; and Daniel D. Summerfield a former master’s student in the Department of Materials Science and Engineering.